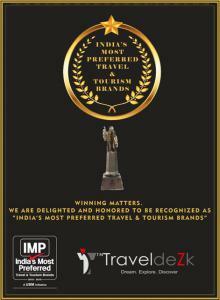 The prestigious crystalline statuette in the INDIA’S MOST PREFERRED TRAVEL & TOURISM BRANDS 2018. 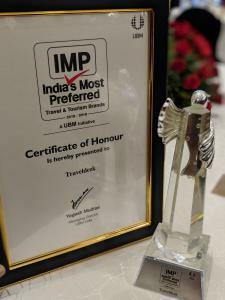 MUMBAI, MAHARASHTRA, INDIA, July 4, 2018 /EINPresswire.com/ -- TraveldeZk – A unit of AS TraveldeZk Pvt Ltd has earned the prestigious crystalline statuette in the INDIA’S MOST PREFERRED TRAVEL & TOURISM BRANDS 2018. The first ever INDIA’S MOST PREFERRED recognition — known as the SEAL OF TRUST of the travel fraternity — were held on Wednesday, June 06, 2018 at Hotel Shangrila-Eros New Delhi to recognize the highest standards of excellence in the service industry by honoring travel companies, travel products, travel agencies, hotels, resorts and destinations by the analysis done on current market trends, through a BSE listed Market research Agency for their outstanding achievement. This research-based initiative was designed with an agenda to recognize the efforts of the select few Brands in India who have restructured the way markets operate. The collaboration with a Market Research agency was to shape up the result which was executed on certain parameters. The winners were then honored during an award dinner and presentation attended by the finalists, members from the tourism ministry, industry leaders and travel professionals from the pan India. “It’s an honor to be recognized as INDIA’S MOST PREFERRED TRAVEL & TOURISM BRANDS 2018 as our win was determined by those who know us best: travel agents and their clients,” said Aamir Sayed, Director. 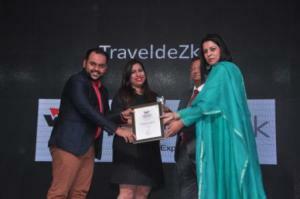 “This award is a testament to TraveldeZk’s commitment in providing an impeccable professional service to all our guests, where we Explore to realize your Dream destinations.” stated Shahista Chhatriwala, Director. TraveldeZk prides itself in providing end-to-end, custom-designed travel solutions to serve patrons’ every need. Established in April 2015, the brand has since dedicated itself to ensuring high consumer satisfaction through consistent competency and personal touch. From adventurous travellers with a thirst for backpacking to those who prefer the snug lap of the luxury, TraveldeZk has served all — and, as we make further inroads into the industry, will continue to do so with immense enthusiasm.